We added a new feature to HackerRank for Work: reminder emails. 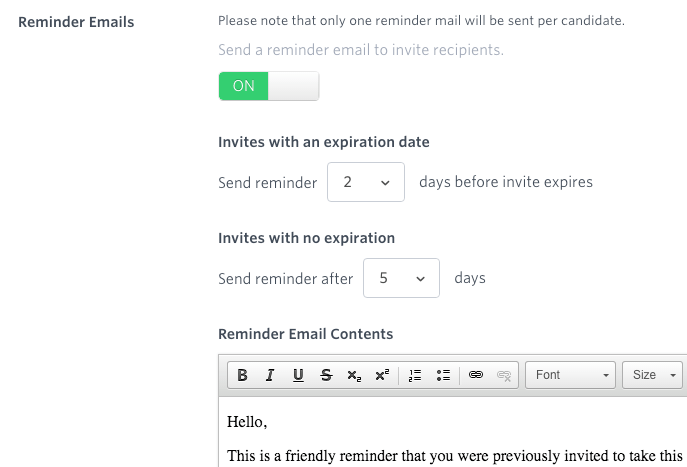 For each invite you send, you can opt to send one reminder email with customizable contents. This is a simple way to increase the number of candidates that attempt your tests. Using the reminder emails feature is simple. Turn it on, select the timing of the reminder, and set the contents. You can enable reminder emails for a test from the miscellaneous section of its advanced settings. You can also set a default value for all invites you send in your personal user settings. Do some spring cleaning with archived tests! Your tests page just got a little tidier. Until now, all of your tests lived in one big list with no indication of whether or not the test was actively being used. To help communicate whether a test is in use or not, we’re introducing a separate listing of Archived Tests. 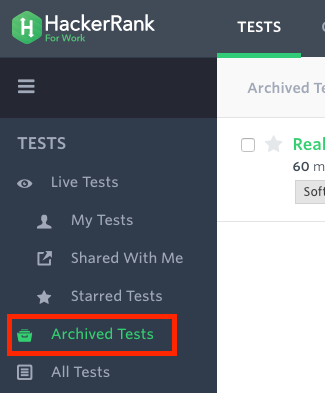 You can archive a test from your main test list by checking the box left of the name and clicking the archive button. All of your test’s data is retained, and you can restore it back to the main list at any time. Invites cannot be sent for an archived test, but any outstanding invites or in-progress candidates will not be affected. We see the archived tests list as a way to declutter and focus your test list. By storing your old tests out of view, you can focus on the tests you’re actually using without worrying about losing any data. Author NickPosted on May 9, 2016 Categories UncategorizedLeave a comment on Do some spring cleaning with archived tests!